In what might be the biggest documentary since that penguins thing comes a study of one of the greatest and most influential filmmakers of all time, George Romero (who incidentally made my #1 favorite film). This has been in the works for years by documentarian Rusty Nails and while it's had some showings I think the biggest question is, when do we get to see it? Read on for further info and trailer. "Dead On will go over George's fantastic body of film work as it stands to date. We will also investigate a number of aspects of George's work, working style, and involvement with the independent and Hollywood film communities. Among some of the current participants in "Dead On" are Dennis Hopper, Ed Harris, Stephen King, John Carpenter, Dario Argento, Wim Wenders, Judith O'Dea, Nicky "Bomba" Tallo, Richard "The Rev"Ricci, Nick Mastandrea, John Harrison, Bob Clark, Glenn Danzig, Danny Boyle, John Waters, Quentin Tarantino, Richard Linklater, Penn (Penn & Teller), Patti Tallman, Robert Rodriguez, Scott H. Reiniger, David Emge, Bingo O'Malley, John Landis, Stuart Gordon, Mick Garris, Tim Sullivan, Debbie Rochon, Ken Foree, Elvis Mitchell, Rob Zombie, Roger Ebert, Lori Cardille, Tom Savini, and many others. George Romero is one of the most important voices in independent cinema. Mr. Romero's debut feature Night of the Living Dead scared people around the world and would be the starting point of a life long journey into intelligent, thought provoking cinema for George which would lead to the creation of such milestone films as The Crazies, Martin, Dawn of the Dead and Day of the Dead. 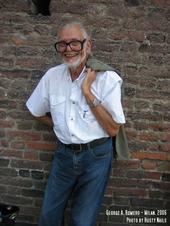 George Romero's films are noted for their wit, keen topical observations and superb character dynamics. Rusty Nails' film, DEAD ON: The life and cinema of George A. Romero, will delve into George Romero's lifelong obsession with creating fantastic films."